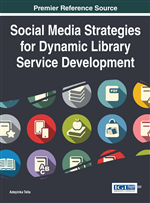 This chapter examines the use of social media in the training and education of undergraduates of Library and Information Science. The target population of the study comprises of Library and Information Science (LIS) undergraduate students selected from two tertiary education institutions in Kwara State, Nigeria. From this population, 260 LIS undergraduates selected through a simple random sampling technique represent the sample for the study. A self-developed questionnaire was used to gather data from the respondents. Descriptive statistical data analysis method was use to analyse the collected data. The results of the study are presented using frequency tables, percentages, and charts. The major findings from the study are that LIS undergraduates and lecturers from the participating tertiary institutions in Kwara State perceive social media as mainly for chatting with friends and relatives. The findings also indicate that making use of social media contributes to undergraduates' grades and thereby improves their academic performance. Library Information Science (often termed library studies or librarianship) is an interdisciplinary or multidisciplinary field that applies the practices, perspectives, and tools of management, information technology, education, and other areas to libraries in th the collection, organization, preservation, and dissemination of information resources; and the political economy of information. Library and Information Science emerged as a separate field of study in the second half of the 19th century. The first training program for librarians in the U.S. was established by Melvin Dewey in 1887. In the 20th century, Library Science was gradually subsumed under the more general field of information science. Although schools had been established in Nigeria as far back as 1842, no thought was given to the establishment of libraries and training of librarians until the second half of the 20th century. This was the time, when modern libraries that were first established in Nigeria as a result of the establishment of research institutes and their libraries, had acute staffing problem. Initially, these libraries were almost completely manned by expatriate. With the proliferation of libraries over time, it became apparent that the existing expatriate could hardly cope with the management of the growing number of libraries. The demand for trained and professional librarians. There were libraries with large buildings and growing collections, which required expert management. The increase in world population and literacy required more libraries and qualified librarians to man them. Trained manpower is required for the complex and scientific nature of library operations. Today, there are many library schools producing LIS graduates to serve growing need and demand for librarians in the country. Majority of these library schools have many programmes in place including regular and sandwich programme that lead to the awards of bachelor degree in LIS. In the training of these undergraduates in LIS, some of the library schools and lecturers are now found tapping the great potentials of ICTs to facilitate teaching and learning in the discipline. This now resulted to the use of Internet and the latest development in the Web 2.0 which paves way for the social media and social networks. Social media are internet sites where people interact freely, sharing and discussing about each other and their lives, using different mediums such as Twitter, YouTube, Facebook, My Space, Flickr, ebuddy, Instant Messaging, Yahoo Messenger, BlackBerry Messenger (BBM) Webstagram, LinkedIn, Instagram, EarthLink, AOL, Google, Tumblr, Wikipedia, Wikidot, WordPress, CompuServe, iTunes and so on. At these websites, individuals and group create and exchange contents and engage in person-to-person conversations. Social media refers to the means of interaction among people in which they create, share, and/or exchange information and ideas in virtual communities and networks. A group of internet based applications that build on the ideological and technological foundations of Web 2.0 and allows the creation and exchange of user-generated contents and depend on mobile and Web based technologies to create highly interactive platforms through which individuals and communities share, create, discuss and modify user-generated contents (Kaplan & Heanlien, 2010). Furthermore, social media introduces substantial and pervasive changes to communication between organizations, communities, and individuals.